During September 2003, a trial excavation was conducted at Khirbat et-Tira, within the precincts of Moshav Bareqet (Permit No. A-4007; map ref. NIG 194730/658699; OIG 144730/158699), prior to the construction of an industrial zone. The excavation, undertaken on behalf of the Israel Antiquities Authority and underwritten by Moshav Bareqet, was directed by G. Hillel, with the assistance of Y. Dangor (administration), V. Essman and V. Pirsky (surveying), T. Sagiv (field photography) and Y. Porath (plaster identification). The excavation area was located in the ruins of the Arab village et-Tira, on a rocky slope north of Moshav Bareqet. 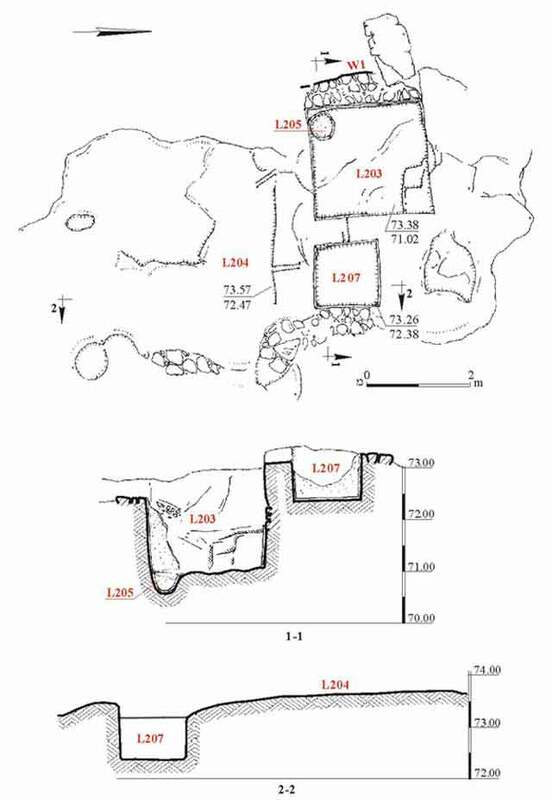 A plastered pool was identified at the site during the survey of Lod (Map of Lod , Site No. 18). The excavation exposed a winepress, hewn in limestone bedrock, which included a treading floor, a settling pit and a collecting vat (Fig. 1). All that remained of the treading floor (L204) was its northern side that connected to a settling pit via a channel on the east. The settling pit (L207; 1 × 1 × 1 m) was entirely coated with gray plaster; to its west was a collecting vat (L203; 2.20 × 2.34 × 2.30 m), coated with two layers of plaster, in an excellent state of preservation. The bottom plaster layer was gray and contained charcoal inclusions and very fine gravel (thickness 4 cm) and the upper layer consisted of pink plaster that was common to the Late Roman period until the beginning of the Byzantine period. A rock-hewn step (0.75 × 0.56 × 1.07 m) was in the southeastern corner of the collecting vat and a hewn round sump (L205; diam. 0.55 m, depth 0.35 m) coated with a thick layer of plaster was in its northwestern corner. Based on the dimensions of the collecting vat it is estimated that the winepress had a liquid capacity of up to 8 cu m and it was probably used by more than one family. A wall (W1; height 0.73 m) was built along the western side of the collecting vat to evenly level this side with the level of the eastern side. The wall consisted of roughly hewn fieldstones and white bonding material. 1. Winepress, plan and sections.